Hi my name is Jacqueline, everyone who is near and dear calls me by nickname: Jackie. I am a very blessed wife and mommy with many job hats that works for Free, but barters with hugs and kisses, 24 hours a day, 7 days a week, 365 days a year. 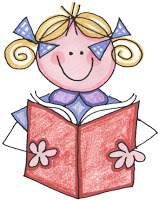 I am a homeschooling stay at home mommy to 5 Lil’ Rascals for 10 years and schooling for 4 years. 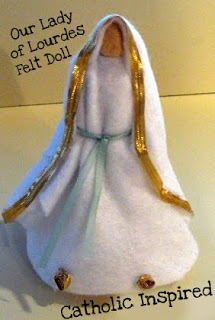 We also have a lil’ Baby Love angel up in Heaven above who sadly died of fetal demise in February 2008. Our extended pet family includes 2 cats Valentino and Tigger, and one cutie beagle Buster Brown. I have been married to my soul mate, best friend and husband Dennis for 11 years and blessed to know his beautiful soul for 14 years and counting. Before my blessed mommy years I worked and aspired in a career in marketing. For 10 years I worked as a graphic and web designer and then as a project marketing consultant and analyst for several New Jersey and New York advertising agencies as well as newspapers in the tri-state area. I use my God-given talent and background in business to help me with my homeschool and mothering ministry. 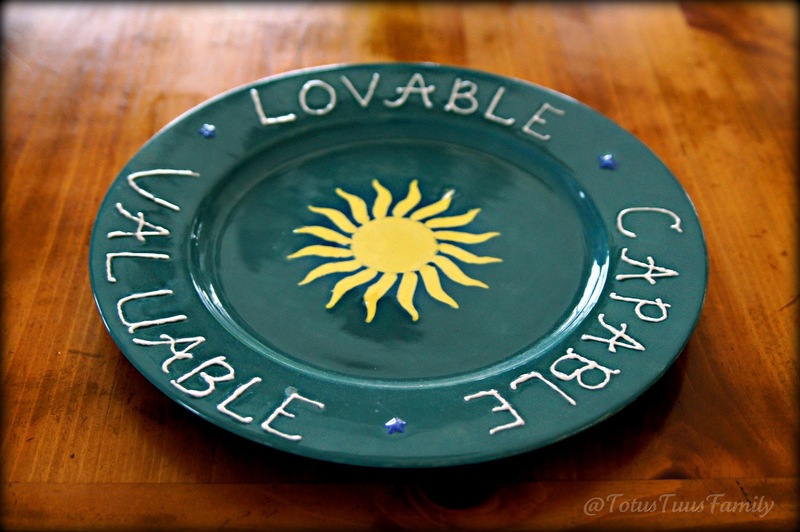 For a while, in my early mommy years I thought I was totally useless to the working world, but I slowly realized with help from many of my favorite Catholic authors and bloggers that this was not the case. God is awesome and He had a very definitive purpose for my life,whether in my career or as a mother. My background in business has helped me to organize and fulfill happiness in my domestic church (aka- my home) as well to properly organize my children in homeschooling and extracurricular activities. Because of the many online mommy blogs I read, I was able to learn about this beautiful and divine ministry of mothering and get out of my slump. My personal goal with my family blog is to chronicle my Catholic family trying to live the word of God everyday through His grace and infinite wisdom. Life is supposed to be messy, and not perfect. I hope to chronicle the good times with the bad, and also to be able to payback forward and mentor those who are just walking into the divine and heavenly trenches of mommy hood, as it was done to me early in my mommy stages. It’s a beautiful ministry made from the hand of God. Our American culture is too quick in giving our mothering ministry a bad name. In time and with God’s grace, we as mother’s have to realize that we are not in control. One day at a time, one thing at a time is my piece of advice to any mom in need of spiritual uplifting, and it may sound silly but always try to have God on your mind when you drink that glass of water. It’s simple lil’ thing I do often during the day. I am always thankful to God, but the only time I have for prayer is when I drink a glass of water, and it’s for 1 minute, if that! =) As a mommy we will have our good and bad days. On those bad days with the kids frayed on your nerves and the house messy and husband getting at your last lil’ nerve, PRAY. It works and keeps you sane and happy. I truly believe it’s our divine vitamin from God. Welcome to the Contibutor Pages! 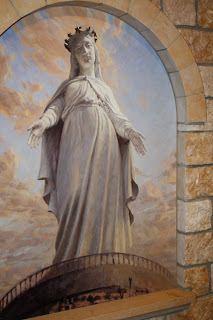 If you would like to be a regular contributor to these pages, please respond with comments on this post mentioning your Catholic blog address and your email address. For the time being, we have decided not to create a schedule for posting. 1. Be brief! We are happy to help you increase traffic on your site! Please post only 1-2 photos and a brief summary of your post, with a link to your complete blog post. With shorter entries, readers can skim through many more posts on the one Contributor page and will refer to individual blogs for more information…increasing traffic to your site! 2. Please post only ONCE a week in your category* to give others a chance! We plan to have special link-ups on specific Feastdays, so that everyone can share their Feastday posts, particularly on the Homeschooling, Crafts, Traditions and the Liturgical Calendar contributor page. *If your category is Catechism/Apologetics or Scripture, Sunday Readings and Homilies, you can probably link more often, as there are fewer contributors in these categories. 3. 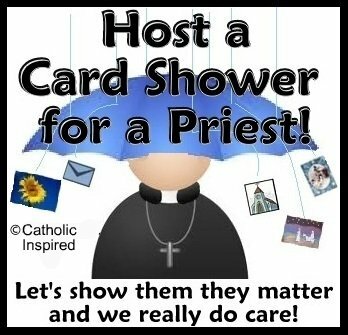 Please have at least one clearly visible Catholic Bloggers Network button on the home page of your blog. If you’d like to include a link at the end of the post on your blog, we’d appreciate that too! 4. Try to include a signature biography with a photo (or blog button). Until we figure out how to make a template for these, this is mine. 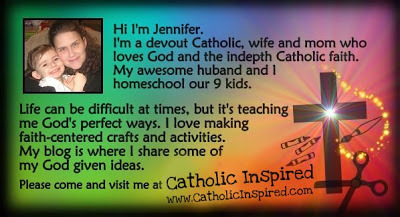 I’m Monica and I am a wife, a Mom of 5+ kids, a designer, an architecture school survivor, an author and a crafter and I think it’s cool to be Catholic! My husband and I founded a Catholic apostolate called Arma Dei (Armor of God; Ephesians 6:13-17) creating solid Catholic, fun teaching tools and gifts to celebrate and teach the Catholic Faith. 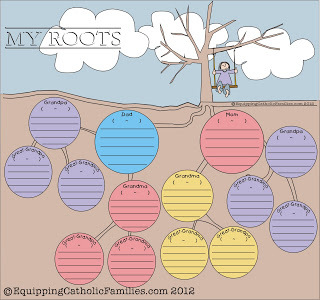 I like to post about these family-building and Faith-centred crafts on EquippingCatholicFamilies.com ! Wow! What a week it has been! 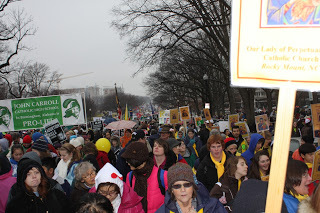 It was a blessing to go to the March for Life last week (has it already been a week since the March in D.C.? ), but it’s always a challenge to get home from a short/long trip and get back into the routine. I felt like last week I was playing “catch up” after I got home, especially since life never stands still when you go away for a bit! 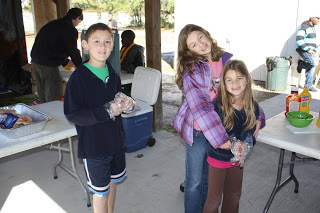 This afternoon our homeschool group volunteered again with a local inner city homeless ministry. 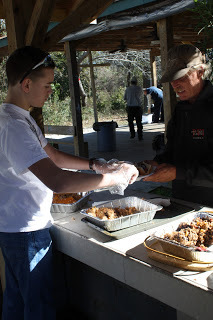 Our homeschool group provides food and serves the food whenever there is a 5th Sunday in the month. 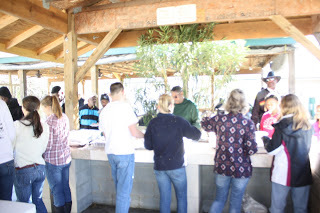 There are volunteers every Sunday at a well-known spot downtown and our homeschool group was blessed to be a part of the food preparation and serving today. 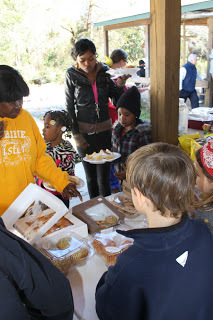 We had adults and children ranging from age 7 to teens helping out, including my three oldest “cupcakes” and myself. 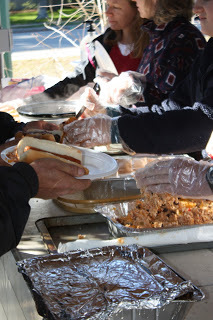 After the preacher talked with the men, women, and children during an informal church service under an open-air pavilion, they were invited to eat a warm, home-made meal provided by many families and volunteers. The chicken can be cooked the day before in a crock pot or that morning on the stove. Place chicken breasts in a crock pot and add 1-2 jars of salsa, enough to cover the meat and provide a bit extra. Cook on low for eight hours, until the chicken is done, then shred the the meat with two forks (very easy to do when the chicken has been cooking all day). Mix in 2-3 cups of cooked rice. Place in disposal serving pan, top liberally with cheese. Heat through, until cheese is melted. This recipe is very forgiving. It was originally intended to be burrito filling. You can add in corn or beans, more rice or salsa… whatever you want; it all tastes good. You can also use any precooked chicken that you have- just chop it into small pieces first. Some families also made Baked Apples which was also a hit! I am always impressed by how friendly and gracious the people are as we feed them. Many of them thank us over and over again for our service. As the volunteers, we are blessed in many ways also by serving in this ministry. 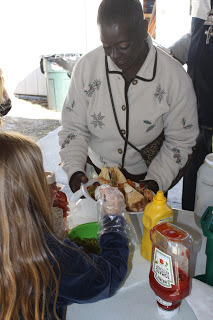 Here are more photos from our afternoon of helping those who always look forward to a warm, home-made meal, a helping hand, and a friendly smile. 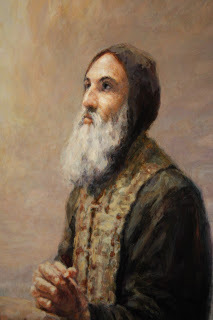 Then the upright will say to him in reply, “Lord, when did we see you hungry and feed you, or thirsty and give you drink? When did we see you a stranger and make you welcome, lacking clothes and clothe you? 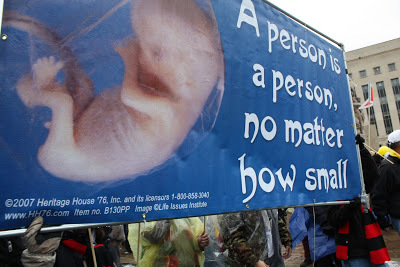 A few days before leaving for the 39th annual March for Life 2012, I thought of this phrase…. 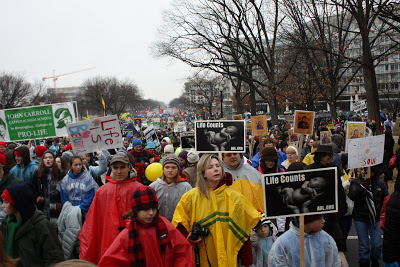 Why do we March for L.I.F.E.? 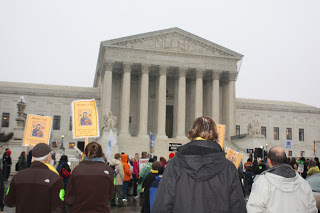 Last year my family and I attended our first March for Life and I blogged about this incredible experience HERE. 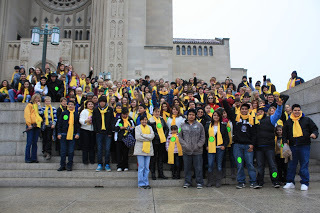 This year, my daughter, friends, and I joined a parish in Rocky Mount, NC and traveled to our second march on buses. There were three large buses filled with 150 people from Rocky Mount and surrounding areas. We left early Monday morning, January 23, 2012 at 6:00 AM from Rocky Mount, NC to our nation’s Capitol for the annual March for Life rally to protest the 39th anniversary of Roe v. Wade and the legalization of abortion. 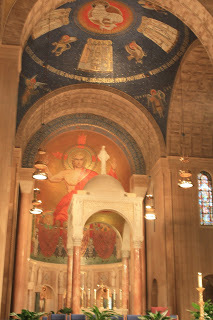 Our first stop when we arrived was the Basilica of the National Shrine of the Immaculate Conception. 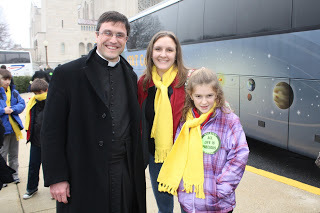 As soon as we got off the bus, I had a friend snap this picture of my daughter and me standing with Fr. Tim Meares, priest of Our Lady of Perpetual Help in Rocky Mount. Fr. Meares has been on many marches and we were all blessed with this holy priest’s presence during our trip. 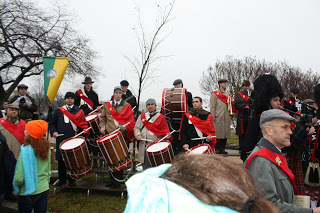 Each year there is a Holy Mass for Life for all the N.C. pro-lifers present at the march. It is just so beautiful to see the many priests and seminarians and our two bishops from the Raleigh and Charlotte Diocese celebrate Mass with the packed church. Although I missed celebrating this march with my husband and other three children, it was very special to have my daughter with me to share such a powerful event. It’s never too early to teach our children that life, no matter how small, is precious and sacred. 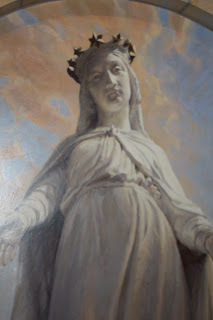 Down in the Crypt Church of the Basilica, I found Cameron Smith’s artwork (No relation to me). Cameron and his family are in our homeschool group and are dear friends. 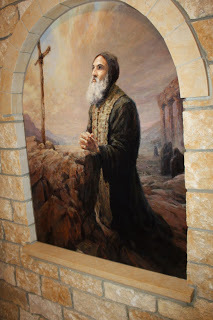 He has incredible God- given talent and he did a painting on marble of Saint Maron and and Our Lady of Lebanon for the Maronite chapel and these beautiful masterpieces are located in one of the many side altars. You can visit Cameron’s website HERE to see his other beautiful prints to view/purchase. The weatherman called for 90% chance of rain in the afternoon and after we left the Basilica it was drizzling, but then it stopped during the march. The sky was gray and gloomy, but the spirits were high which made the day much brighter for sure. 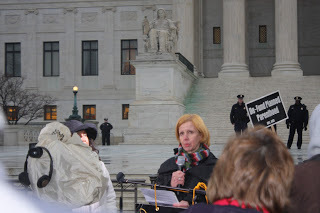 After our group gathered at the Navy Memorial, we marched with an estimated 300,000-500,000 pro-lifers. It’s hard to know the exact number, but based on previous year’s estimations, I’m guessing this many people might have attended this year’s march. 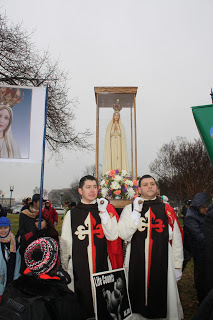 There were men, women, and children from all ages, races, religions, and walks of life joining together to stand for life one step and prayer at a time. It was breathtaking, exhilarating, and powerful to walk among the masses. There was a sea of love, as one friend put it. There was no anger, fear, or hate in the crowds. Rather, there was a feeling of security, hope, peace, joy, and love and all the young people present gave me hope for our future. Speaking of our young generation, here are a few beautiful teens that I know from my homeschool group. 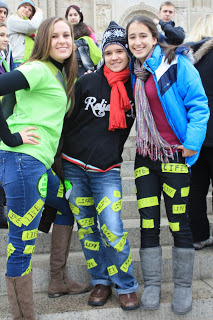 They and about 13 others came to the march and are part of our local Teens for Life group. Not only are they shining witnesses for life, but they also love spreading the message of life with bright smiles and duct tape! Awesome! 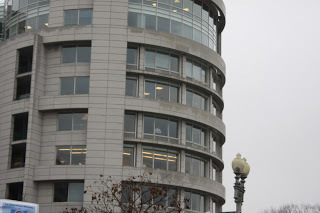 At one point while we were walking we noticed two businessmen watching from high above the crowds from their office windows. We were waving at them to get their attention and they waved back. I wanted to be up there to witness from their vantage point the hundreds of thousands marching. I was wondering what they were thinking? Were they encouraged as pro-lifers themselves? 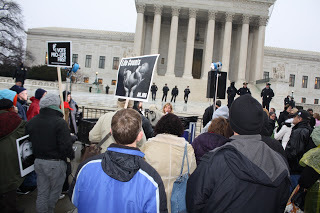 Maybe they were in awe of the crowd, despite being pro-choice? 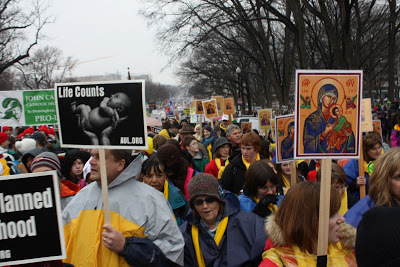 Maybe they were wondering how the news media could continue to miss this BIG story about March for Life each year? Maybe they were amazed that so many people could come together peacefully? 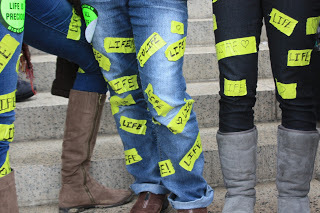 Whatever they were thinking or feeling, we as pro-lifers might have planted seeds in their hearts to always defend life! 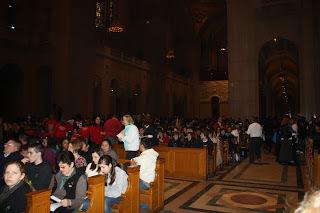 Here are photos of the crowds. Like last year’s march, I never saw the beginning or the end of the march and I hear the numbers who attend gets higher and higher! 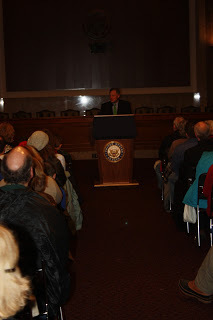 We stopped at the Congressional Building for a small reception and to listen to our NC Senator, Richard Burr, speak. We also listened to Congresswoman Renee Ellmers. 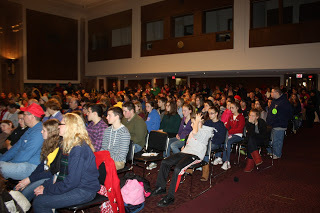 Both gave the audience words of encouragement to keep marching on to defend life. 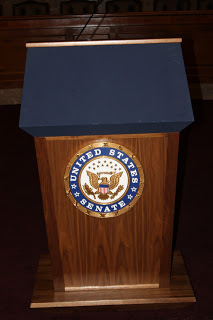 After we left the Senate building, we headed toward the Supreme Court where we listened to women tell their stories about how they had an abortion and how much they have suffered physically, mentally, physcologically, emotionally, and spiritually from their decision. It was heartbreaking to hear their stories, but they share their stories to help others through a project called Silent No More Awareness Campaign. A few feet from where the women were speaking there were different signs that were being held up. It didn’t even register in my mind that these signs were not like the ones I was blessed to see all day during the march. No, seeing these signs made me sad…because these women’s stories were filled with pain, grief, sadness, confusion and even hope, but only a few feet away pro-abortion signs were being held up proudly. 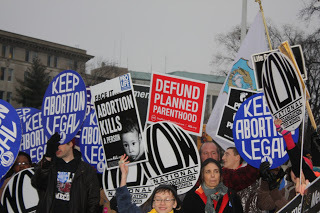 I snapped a picture of signs that read “Keep Abortion Legal” and the pro-life signs that read “Defund Planned Parenthood” and “Face It….Abortion Kills a Person”. 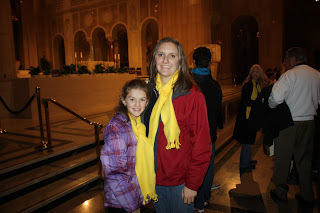 My 11 year old daughter didn’t understand why anyone would want to keep abortion legalized. She kept asking me “why?” I told her I don’t understand it myself, but we need to keep standing up for life and praying for conversions so that all people will see that each human person is made in the image and likeness of God and each life, no matter how small, no matter the circumstance, is sacred and valuable. because Life Is For Everyone! 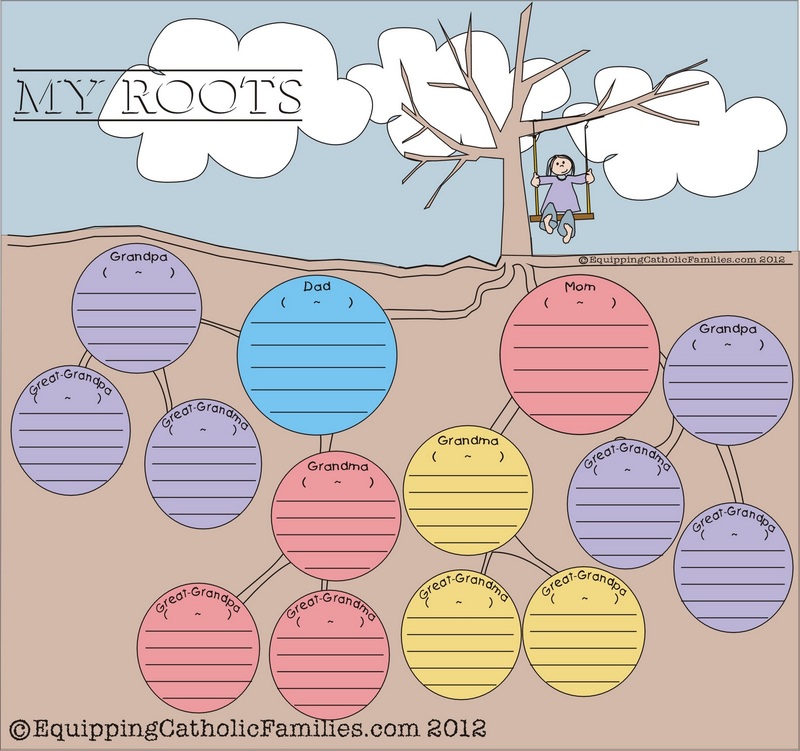 and the Seasons and Feastdays of the Liturgical Calendar! please leave your email address and Catholic blog address in the comments below! 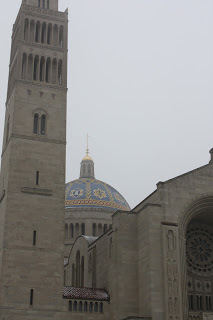 Please kindly remember…This blog attempts to post only material and ideas that are in conformity with the teachings of the Holy Roman Catholic Church, Sacred Scripture, the Apostolic See, and Catholic Tradition. Anything that is contrary to the aforementioned is accidental and unintentional and will likely be removed. …please contact us so that we can address it appropriately.